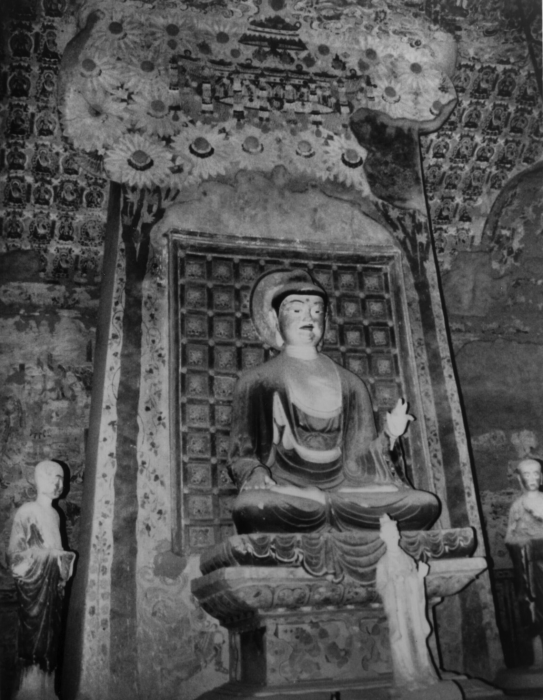 Wall paintings and polychromed and gilded clay statues of Buddha (the oldest dating from the fourth century A.D.) are found in cave interiors at the Mogao site. Dunhuang (population 100,000) is on the southwestern edge of the Gobi Desert and is situated some 1,100 miles due west of Beijing, in Gansu Province, northwestern China (40.05°N, 94.45°E). Near Dunhuang are the Mogao Caves (altitude about 5,000 ft.; annual rainfall 25 mm). The climate is temperate continental with warm, dry summers and cold winters. Temperatures average 26°C in July and -7°C in January. Wind and sandstorms occur throughout the year. The Mogao Caves were cut into a natural cliff face, 80 to 100 feet high, running roughly north-south, and consisting of soft, poorly cemented fine-grained conglomerate grading to sandstone. A total of 492 caves are situated along one mile of cliff face in five strata, and date from the 4th century A.D. onward. They comprise a treasure-trove of Buddhist wall paintings and painted sculpture. The site is on the United Nations Education, Science and Cultural Organization’s World Heritage List and its importance derives also from the location of Dunhuang on the Silk Road linking Central Asia with China. As such, the site is one of immense historical, religious and artistic importance. Despite severe natural erosion and vandalism, some 45,000 m2 of frescoes and more than 2,000 painted sculpted figures (the largest is 33 m high) have survived. Tourism at Mogao is growing rapidly, placing pressure on the Dunhuang Academy, the local managing organization, to open more caves. Data were needed on the impact of tourism—particularly the effects of humidity and microbiological deterioration—to develop effective preservation policies. In an effort to reduce the sometimes harmful tourist traffic, the project eventually led to the construction of replicas of the 10 most popular caves. The environmental monitoring program was proposed as one of the site conservation efforts by the Getty Conservation Institute (GCI), to identify the effects of visitors on the deterioration of wall paintings and sculptures. Six caves were intensively monitored for relative humidity, air temperature, surface temperature, carbon dioxide, indoor and outdoor particulate matter, visitor count, and duration of visit. Completed in 1995, the project formally started in September, 1990, when the environmental monitoring stations for the caves were installed. During a pre-project field trip in October, 1989, the meteorological station was installed on top of the cliff overlooking the site to collect baseline data. The base station was established in a laboratory building of the Dunhuang Academy. The meteorological site consists of a Campbell Scientific CR10 Measurement and Control Module, CM6 tripod, enclosure, solar panel and climatic sensors; data retrieval is accomplished via UHF telemetry (P50 Radios, RF95 RF Modem and battery-powered RF Base Station). A Toshiba T1600 laptop served as the battery-powered base station computer. Because of the problems associated with servicing computers in this area, a secondary data retrieval mechanism was deemed necessary. An SM716 Storage Module was added to the site to provide several months of back-up data storage. Menu-driven utility software was provided as a front-end interface program so that an untrained operator can monitor the system and upload the data with a few key strokes. Weekly, data were also uploaded to a diskette by the technical staff of the Dunhuang Academy and air-mailed to the GCI.